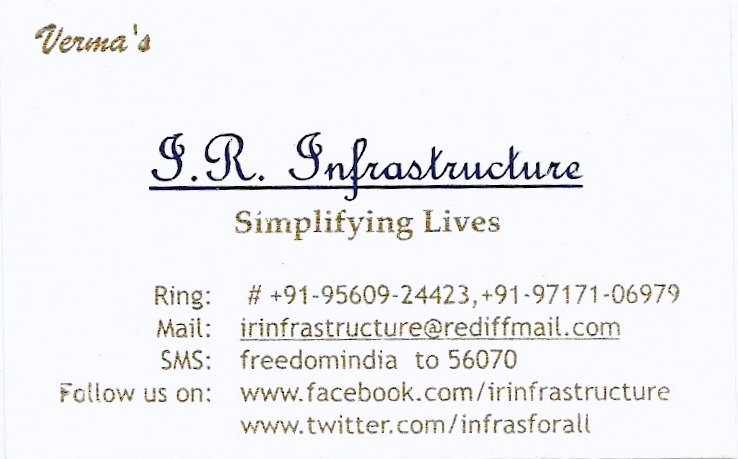 I.R.Infrastructure Presents.. in Greater Faridabad " Sai Kiran Residency " A Fully Integrated Township Having Plots Suiting Every Budget at the Most Economical Price of Rs only Rs 3500/ sq.yd. ( Prices Revising Shortly ) The Plots are of various sizes 50 , 100 , 200 , and 1000 sq.yds.. Prime Location. Now walk down to your Office or for Shopping with a Shopping and Official Complex Situated in the Project. The Project is Very Close to the Proposed Greater Faridabad - Greater Noida FNG Expressway. If you Do Not Have Any Documents for Getting a Property Financed Do Not Worry.Zero Documents/ Zero Percent Interest Loans Available Through I.R. Infrastructure. Just Pay 25 % of the Property Amount and Take Possession of the Plot. Build your Dream Home and start Living. Pay the Rest of the Amount in Easy Interest Free Equated Monthly Installments up to a period of 2 Years. THIS IS A ONCE IN A LIFETIME OFFER. DON'T WASTE TIME IN THINKING. CALL NOW ON +91-97171-06979 OR +91-95609-24423 ( 24 X 7 ) AND BOOK A SITE VISIT FROM OUR CORPORATE OFFICE IN NEW DELHI.